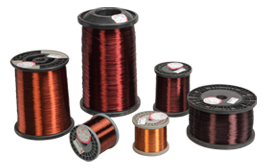 Winding Wire - Round aluminium wire is produced as per IEC, IS, BS, NEMA standards. Our customers are based all over India and includes large & medium Electrical equipment manufacturers and retailers for replacement / repairing sector. PT-15, PT-25, PT45, PT-90 & as per customers requirement. Electrical Motors / Transformers / Automobile / Home Appliances / Light Fittings / Fans / Pump & Other Electrical & Electronic Equipments.